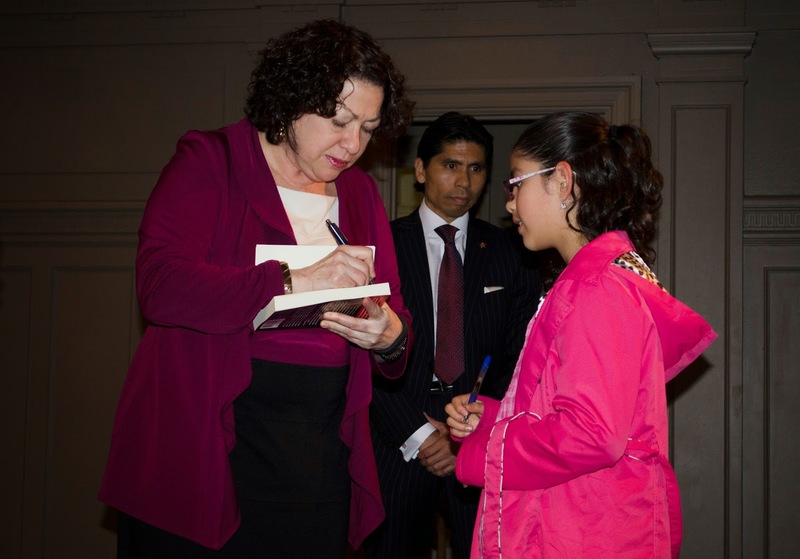 Patty's Utopia: The Night Supreme Court Justice Sotomayor Spoke to My Granddaughter. We arrived very early to the Town Hall in Seattle because we were told that traffic and security would be crazy. 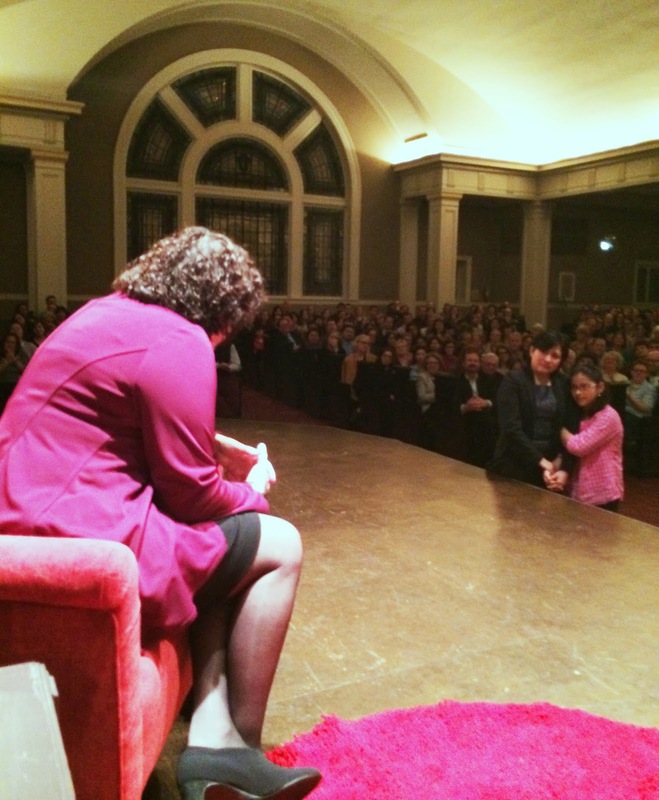 We weren't expecting any less with the visit of Supreme Court Justice Sonia Sotomayor to our Emerald City! So, we arrived at 5:50 PM, and we waited anxiously for the doors to be opened. When we were entering the building, security was checking our purses, bags, and they told us that we needed to keep our phones inside our bags because if we decided to use them to take pictures or video, they would be confiscated. While we were waiting for the event to start, my daughter explained to Lil' Andrea who Justice Sonia Sotomayor is, and they started reading her memoirs together. Lil' Andrea became very excited to know that she was going to be able to see, and listen to such a great leader! The organizers then announced that, if we wanted to ask questions to Justice Sonia Sotomayor, we needed to write them down on the little cards they gave us, and we had to take them to the table that was on the front by the stage. I wrote my questions, and so did Miguel. 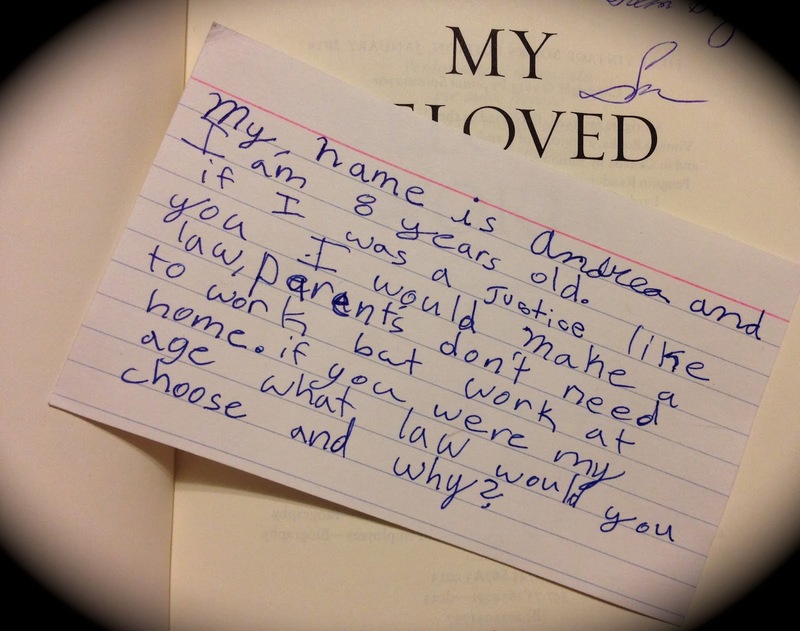 Then, I heard my daughter talking to Lil' Andrea about having to add her name, and her age to the card because, that's the polite thing to do when you are writing a question for someone like Justice Sotomayor. And so she did too. I grabbed all the cards, and took them to the front. I glanced over Andrea's card and saw that she was asking something related to parents, and work, but I didn't read all of it. The time to introduce Justice Sotomayor came, and when she came out to the stage, the audience gave her a standing ovation. The energy was amazing! 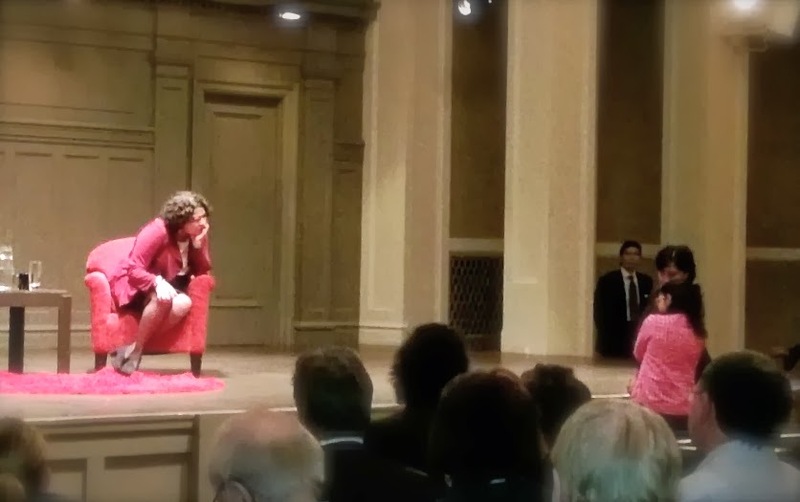 Justice Sotomayor sat down on one of the chairs, and the interview, led by the extraordinary Eric Liu, commenced. During the evening, Justice Sotomayor shared her experiences about how she grew up depending on herself to make sure that she could survive. She shared as well that we all need people to help us, that nobody can do everything by themselves. She talked about not being afraid of saying "I don't know," which is something that many kids are usually terrified to say. But, how else are we supposed to learn new things if we don't accept that we don't know something? She mentioned that it's important to not compare ourselves to someone else. That we need to always compare ourselves to ourselves. We are always the best judges of our own persona. By doing the opposite, we are affecting ourselves in a negative way. During all these comments, Lil' Andrea kept nodding, and shaking her head depending on the topic. She was very attentive, and curious about every single word that Justice Sotomayor was saying. There was a moment when Justice Sotomayor talked about her abuelita, and how she influenced her in her private life. At that moment, Andrea held my hand very hard and she gave me a long kiss. After an hour passed, the moment to read the questions from the audience began. There were questions about justice, about her career, about the obstacles that she had to overcome, and then, the very last question was the one Lil' Andrea wrote! Mr. Eric Liu started reading the card that said: "My name is Andrea and I am 8 years old..."
Mr. Liu was then interrupted by Justice Sotomayor who immediately turned around and said: "Where is Andrea? Andrea, where are you? Come here!" All the friends and family started raising their hands saying "Here! Here!" Lil' Andrea was a little reluctant to walk to the front because of her shyness, and that's when I jumped up my seat, grabbed her by the hand, and said to her ear: "Come on nena (little girl), I will go with you, okay?" We both walked to the front of the stage, and Justice Sotomayor asked her whether she wanted to go up the stage and sit next to her so she could see what it felt to be up there. Lil' Andrea shook her head so hard that the entire audience erupted in laughter. Justice Sotomayor then told Andrea: "I don't bite." But, Andrea was in awe, and so shy that nothing convinced her to move. Then, Mr. Liu continued the question: "If I was a Justice like you, I would make a law, parents don't need to work but work at home. If you were my age, what law would you choose and why?" Justice Sotomayor's answer (what my daughter recalls): "Quality education for all children. Learning something is an adventure. The way our schools are funded, does not allow all the kids to have the same adventures. So if I could wave a magic wand, I would make sure that all kids have the same quality education." She continued talking to Lil' Andrea, and I wish I had been permitted to use my phone to record the message! But I wasn't. When Justice Sotomayor finished answering Andrea's question, the whole building started clapping so hard that made me cry. I was in shock too! 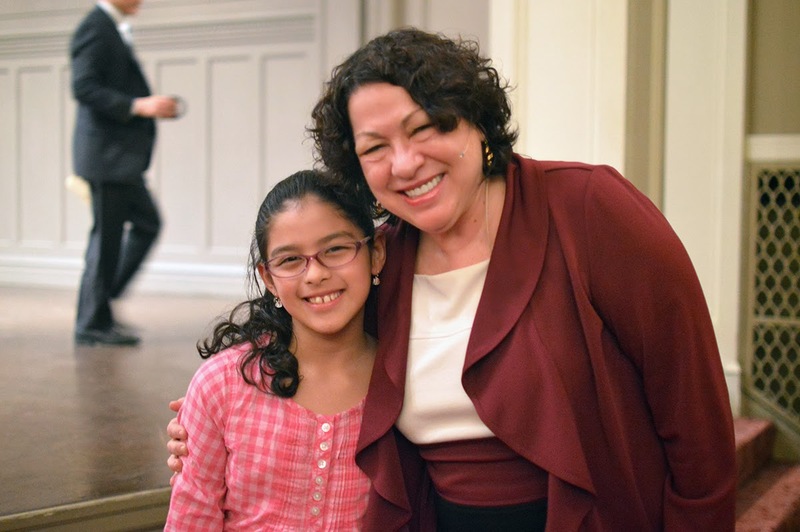 Justice Sotomayor answered Lil' Andrea's question, and she kept looking directly to her. I still get goosebumps every time that I remember it! Photo by Eric Liu from the stage. At the end, Justice Sotomayor asked the photographer to please take a picture of her with Andrea. By then Andrea was more relaxed and she of course accepted the honor of having her picture taken with this amazing Latina, and a fabulous leader in our country! 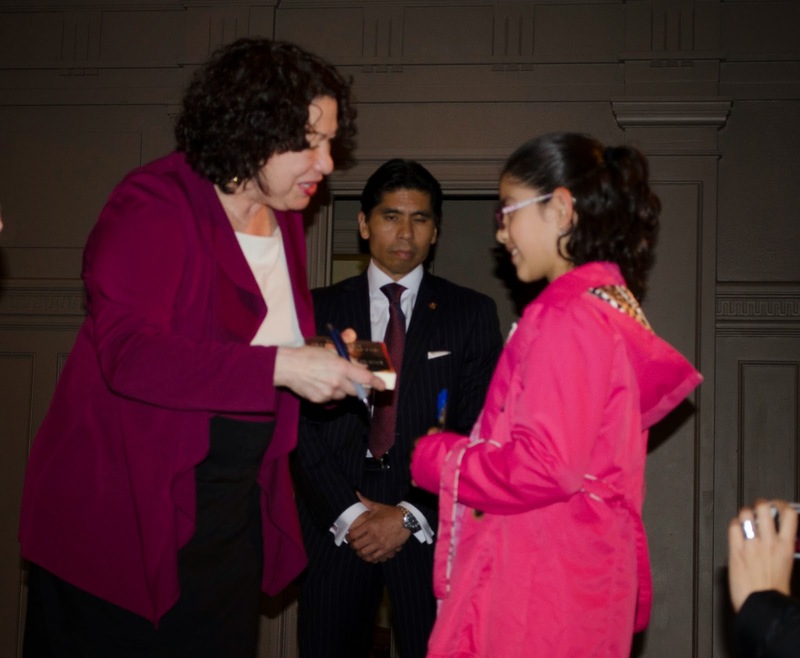 Lil' Andrea then had the courage to ask Justice Sotomayor to please personalize her autograph, and she did that too. This is an experience that we all will remember forever! The question that Lil' Andrea asked. I cannot wait to read her book! Yes it was! We are so happy to have you as part of our lives Tita! This was the highlight of the evening. Andrea was so brave to ask such a wonderful question. It's exciting to think about the potential that her future has for her, and she's off to a wonderful start at such a young age! Thinking about her and knowing how much she enjoyed the evening, when many her age would scrunch their noses, gives me hope for her generation. Awesome! Thanks for sharing this experience. Kudos to Andrea! Thank you for reading it Rebecca! Andrea is really, really happy about this.